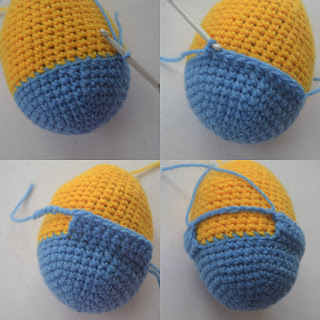 If you are looking for a fun, last-minute Easter egg crochet idea, this is it. It's very quick and you can create many variations in expression using the same pattern. Make them without the overalls or if you want a little more detailing add the overalls. I made 3, one with overalls and two without. Both are equally adorable. 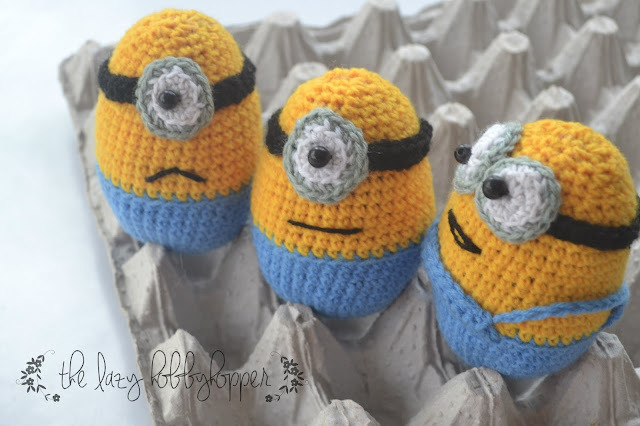 If you are a fan of minions you'll certainly love this pattern! I used sport weight yarn and size D/3.25 mm crochet hook. This gave me a minion which is about 3.75 inches high and 2.75 inches wide. The pattern is easy and uses only simple stitches, so it is suitable for a beginner. 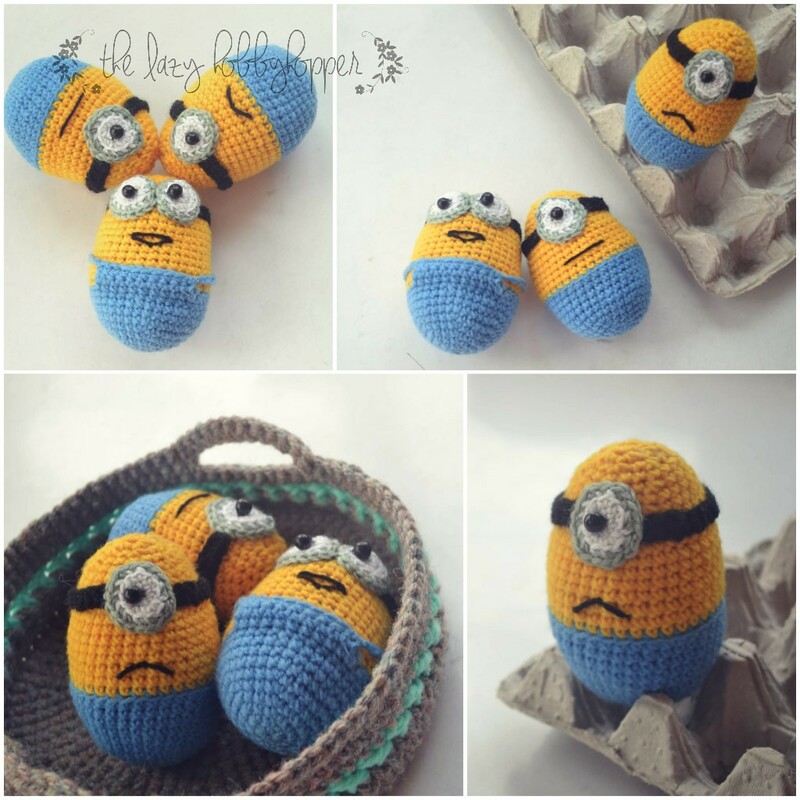 I have given below the instruction for making the minion without overalls. Work in continuous rounds without joining at the end of each round. 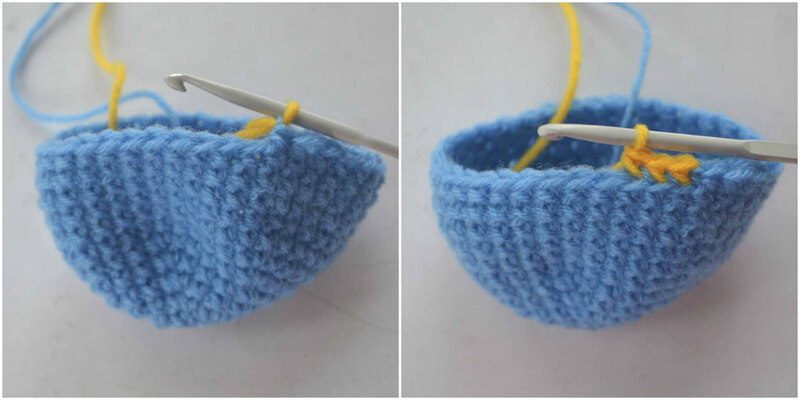 Use a stitch marker to mark the 1st st at the beginner of every round. Round 13: Pull yellow through the loop and working into the back loops only, sc in each st around (36). You can cut off the blue yarn. You can start stuffing at this point. Push in as much filling as possible. Round 28: sc2tog 6 times (6). Cut off yarn leaving a long tail. Thread the yarn through a needle and weave in through every st until the opening the closed. Round 3: Pull grey through the loop and working into the back loops only, [sc in next st, 2 sc in next st] around. Cut off yarn and weave in the ends. Using black, ch 35, sc in 2nd ch from hook and in each ch across. Cut off yarn and weave in the ends. Sew the black strap around the head about 1 inch from the top. Sew the goggle round at the place where both the ends of the strap meet. Sew a black bead at the center of the white part. Embroider mouth. 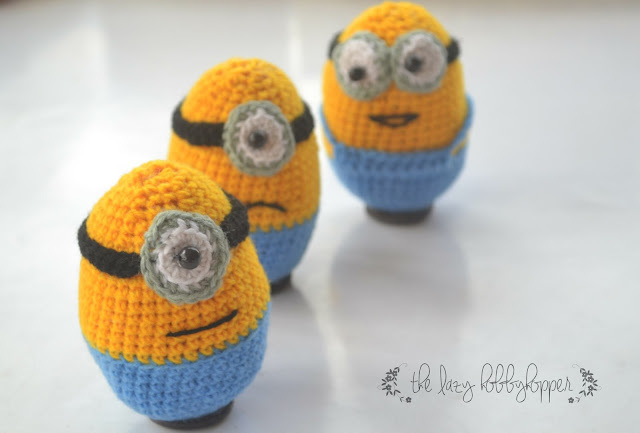 To make the minion with the overall, the pattern for the body is the same as given above except for a few changes. Instead of working with the blue yarn until round 12, stop at round 10. Join yellow at round 11 and continue the pattern but do not sew the goggles and strap. Row 2: Ch 1, sc in each st across. Turn. Row 3: Ch 1, sc in each st across. Ch 8. Cut off yarn. This will form one strap of the overall. Leave 8 sts on either side and repeat the instruction for the back. Then join both the straps to the overall. Now you can sew the strap and goggles. 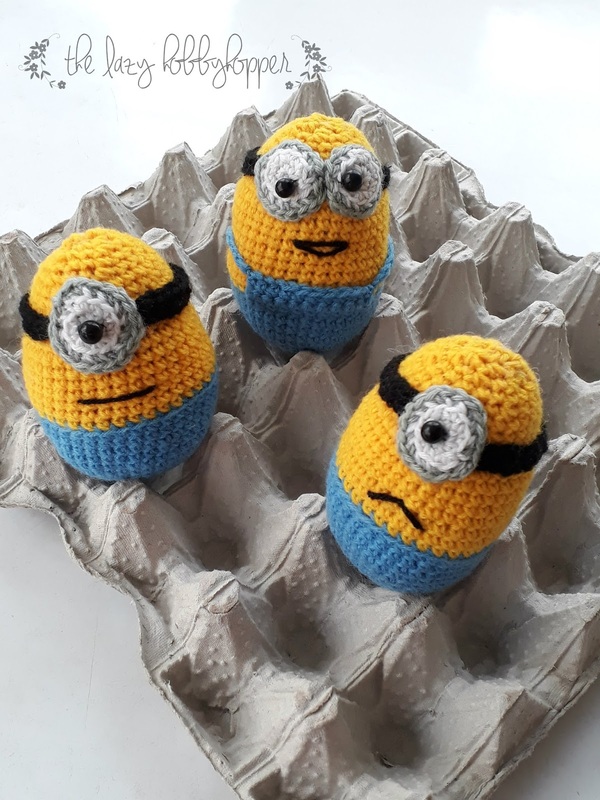 Make different facial expression for each minion by altering the position of the beads and the way you embroider the mouth. You'll love them! And the little ones keep loving the Minions so your pattern will be very popular, I'm sure! They are so cute:) Thanks for sharing!